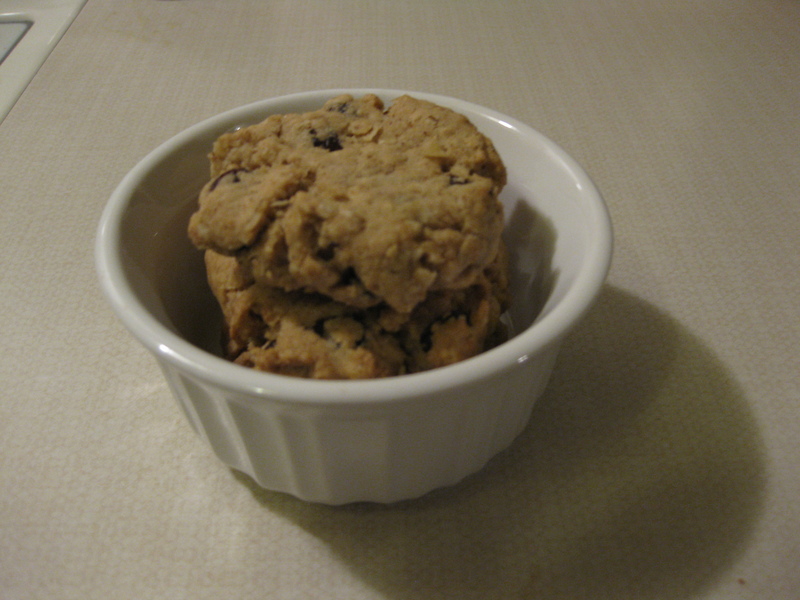 veganmofo 8: Oatmeal Raisin Cookies | Go Fork Go! After commenting about how oatmeal raisin cookies are my favourite cookie ever, I had to give them their own post. I’ve never tried to bake a vegan version of oatmeal raisin cookies. 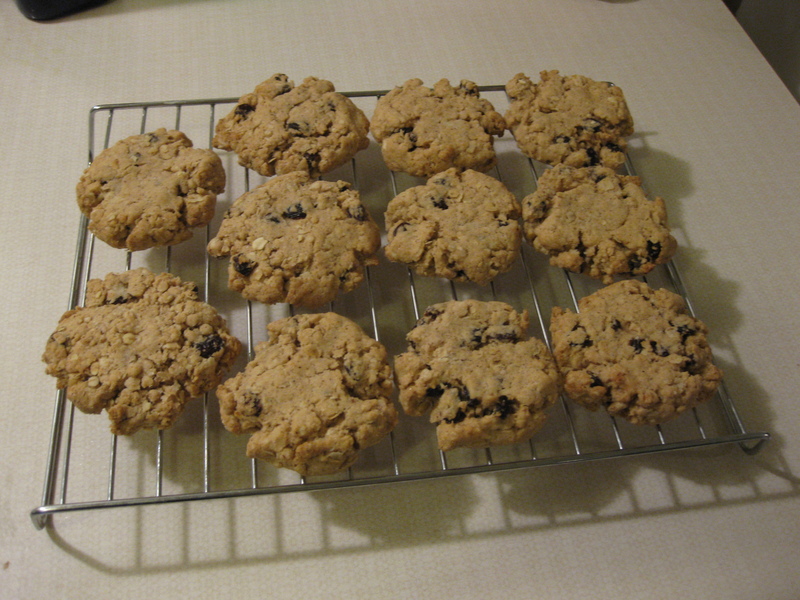 In fact, I only recall making oatmeal raisin cookies once for christmas and they turned out like rocks. That sort of turned me off baking them forever. That was back when I didn’t realize that cookies are supposed to come out soft from the oven because they keep baking. More importantly, oatmeal raisin cookies are better chewy. 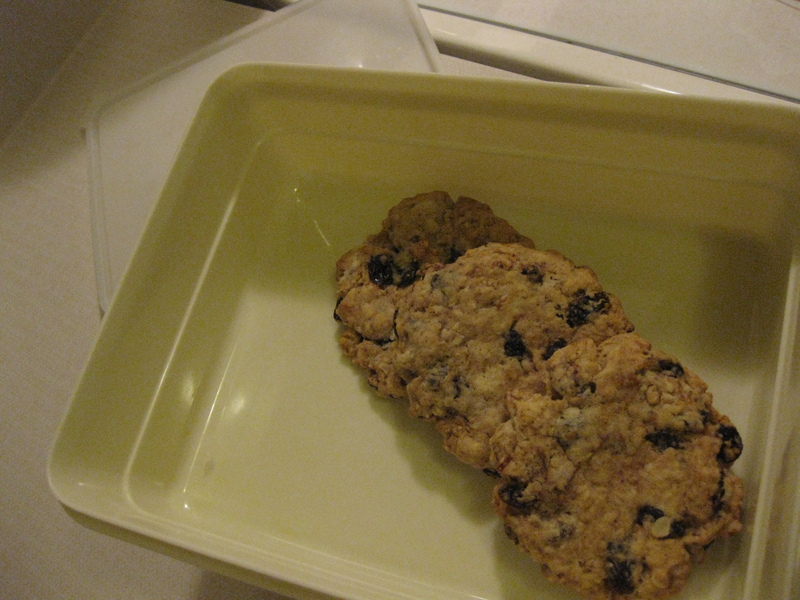 But, I think I have found the oatmeal raisin cookie for me, and it only took one (sort of two) attempts. It’s the recipe from Eat, Drink and Be Vegan! I made these for the first time last Friday. I didn’t like the first cookie I tried from this batch. But they sort of grew on me and I ate five of them one Sunday morning so I think they’re a hit. There is a slight undertaste to them that I think comes from the Earth Balance I used. I will have to try them using Becel Vegan margerine. I find the Becel has a more “neutral” taste, for lack of a better word. The Earth Balance has a very specific taste and smell that I haven’t quite managed to get used to. I’ve also been informed that I need to try the original whipped version of Earth Balance because it is better and tastes more like butter. I just won the EB coupon from Miso for Breakfast so I’m going to pick up some of that from my grocery store and try that instead! I know it looks like I almost got 12 muffins, but it’s because I also ran out of large muffin liners and therefore ended up using the medium ones so I have 10 medium sized muffins. They were yummy and delicious too. 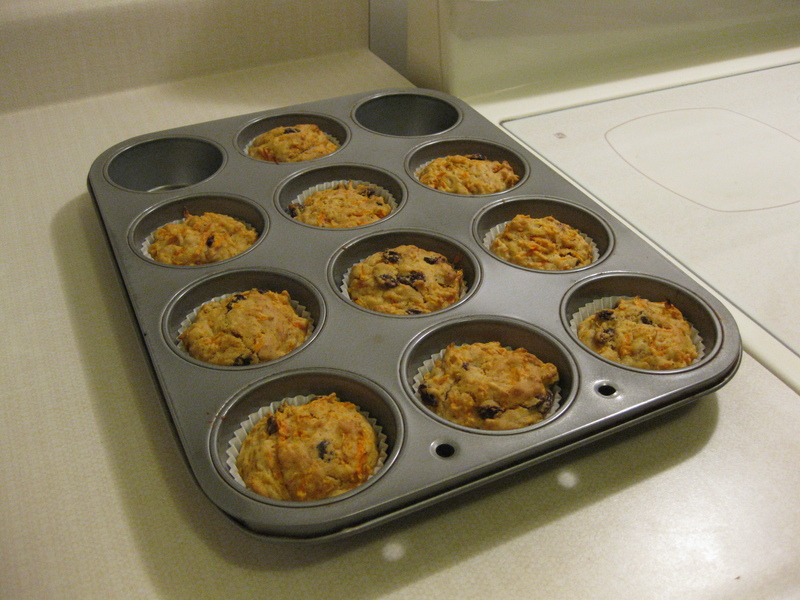 The best thing is that they’re not very sweet as they’re meant to be breakfast muffins. Plus I can pretend that I’m being healthy eating them because they have carrots in them! Oh, and they stuck to the liners on the first night but they’re great now. Back to the oatmeal raisin cookies: After the muffins, I realized I still had half the soaked raisins left and what can you do with raisins after you’ve soaked them? I’m sure I could have just dumped them back in the fridge, but the oatmeal raisin cookies from last Friday were already gone (yeah, I eat too many cookies… shh) and I wanted to try them with becel margarine. Anyway, I made half the recipe for the cookies from Eat, Drink and Be Vegan and got 4 cookies (I know there’s 3 in the picture. I may have already eaten one by the time I took the picture). This time around, the dough was stickier (the first batch, the dough was drier/more crumbly) and the cookies spread a little bit more (although still, they don’t spread much). Anyway, I LOVED this batch. The cookies are exactly how I like my oatmeal raisin cookies to taste and the right amount of chewiness! In addition, the undertaste I described from the first attempt is now gone! So, Becel margarine for my baking, it is. I know, I know, it’s not as healthy as Earth Balance. But I’m not typically someone who slathers margarine over everything so I’m sure that I will survive. In addition, this time around, I made sure to fill the butter to the brim of my cup (last time i might’ve been 1/4 to 1/2 teaspoon short) and I think that helped with the consistency of the dough. And… I only have one cookie left now. So if you love oatmeal raisin cookies as much as I do, run and go try this recipe! This is the second time I’ve heard great things about these cookies in a week, I definitely need to make them.